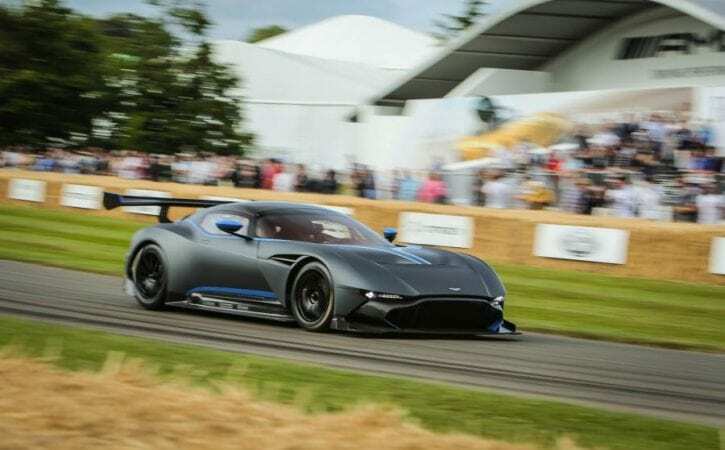 The £1.8 million Aston Martin Vulcan has received its global dynamic debut at the Goodwood Festival of Speed. The exclusive track-only car, of which just 24 examples will be made, was driven up the famous hill climb route by Aston Martin driver Darren Turner. First unveiled at the Geneva motor show back in March, the Vulcan is powered by a 7.0-litre V12 engine producing over 800bhp – making it the most powerful normally aspirated car in production. The Vulcan will be built by an elite skunkworks division of Aston Martin, located near to the firm’s Gaydon headquarters. Engineers will be assemble the car from parts bought in by specialists, mostly race-engineering suppliers, and from Aston itself. A small, hand-picked team of engineers will start making the cars later in the summer, with the first deliveries due at the end of the year. “We will focus all the set-up of the Vulcan on the track,” said project chief David King. The Vulcan is named after the aircraft that once used Aston’s Gaydon headquarters when it was an RAF base. It is built around a carbonfibre tub and is made almost exclusively of exotic, lightweight materials. At the Vulcan’s core is a two-seat carbonfibre tub derived from that used by the One-77. About 50% of the tub is new, with the chassis made stiffer and lighter and adapted to fit a full FIA-spec roll cage. Aston has worked with engineering firm Multimatic on the chassis and body development, as it did with the One-77. The engine is mounted front-midship, with about 50% of it extending back into the cockpit. It is an AMR-developed normally aspirated 800bhp-plus 7.0-litre V12 that drives the rear wheels through an Xtrac six-speed sequential gearbox derived from the Vantage GTE race car’s. The titanium exhaust has two side exits, and Reichman promises flames on downshifts and a sound “to make you stand up and notice”. A 200mph-plus top speed is expected. The Vulcan could prove to be the swansong for the normally aspirated V12 engine in an Aston Martin. The V12 is sure to live on in the next generation of Astons but is likely to adopt turbocharging in the future. The suspension is a pushrod set-up derived from racing. The dampers are adjustable, as are the anti-roll bars. The braking system features Brembo calipers and carbon-ceramic discs, measuring 380mm in diameter at the front and 360mm at the rear, and an adjustable anti-lock braking system sourced from Bosch. The tech spec also includes a variable traction control system, an integral limited-slip differential, a magnesium torque tube with a carbonfibre propeller shaft, lightweight magnesium centre-locking 19in alloy wheels and 345/30 bespoke Michelin tyres. The Vulcan has the same 2.8-metre wheelbase as the One-77 and is 2.2m wide, some 200mm wider than the One-77. It is also about 100mm lower than the 1.2m-tall One-77 and is 150kg lighter, at 1350kg. Reichman says the Vulcan is perhaps the ultimate embodiment of Aston’s ‘power, beauty, soul’ ethos. The Vulcan’s dramatic design mixes a full aerodynamic package with a sculpted carbonfibre body and keen attention to detail through such features as the titanium side strakes and dramatic rear lights made from 27 individual light bars on each side. Reichman says the front-end design provides big clues to the future of Aston’s sports cars, doing away with a traditional grille. “This will be a huge influence for our future sports cars,” he said. “The face of the cars in particular, although we have time to develop that. The two-seat interior focuses on being lightweight but it is not a stripped-out affair. It is very driver centric and completely tailored around the driving experience, with typical Aston quality and craftsmanship and ‘jewellery’ detailing. Materials such as Alcantara, leather, carbonfibre, aluminium and titanium are all used, and every part of the interior, like the exterior, is ‘designed’, right down to the direction of the weave on exposed pieces of carbonfibre. Aston has worked with Darren Turner on the driving position to ensure all the controls are to hand, and to maximise visibility, hiding the slim A-pillars behind the roll cage. His involvement extends to working on the positioning of the mirrors in order to further improve visibility through the polycarbonate windows and screens. The steering wheel is devoid of a top section to allow an unobstructed view of the digital instrument display, which houses all of the key driver information. A huge amount of customisation will be offered on the Vulcan, and Aston expects no two models to be the same. To protect the bodywork in track use, Aston will supply a spare set of unpainted carbonfibre panels, allowing the car to be presevered as “art”. Although the Vulcan is track only, Aston has engineered it to allow owners to ‘single type approve’ it for road use if they require by ensuring items such as lights, the wiper and handbrake all feature in the correct places. Certain customers are likely to take it racing, so it meets full FIA safety regulations. However, Aston Martin has no plans to follow up the Vulcan with a full-blown road car. The production run of 24 units was chosen to link the car to the 24-hour races in which Aston competes and because it is coming out in the year of the 24th James Bond film, Spectre, for which Aston is providing its special DB10 sports car. Reichman says several of the cars are now accounted for by customers, despite having not officially opened any sales channels. Some customers have seen the car and have helped influence the technical spec and supply base for certain parts, but not the design. He expects the firm to have no trouble selling the 24 units, and prices should in time appreciate, as is now happening with the One-77. The Vulcan will in essence rival the likes of the track-only McLaren P1 GTR and LaFerrari FXX K, which are also offered with driver programmes. But Reichman believes Vulcans won’t be an either/or purchase decision next to rivals, but will be bought by people who can afford all the cars in the class.